Lovely morning pick up to join our breakfast with Lion + Ayung Rafting tour, this is one of our selected package which is dedicated for all of you who on Bali Holiday. 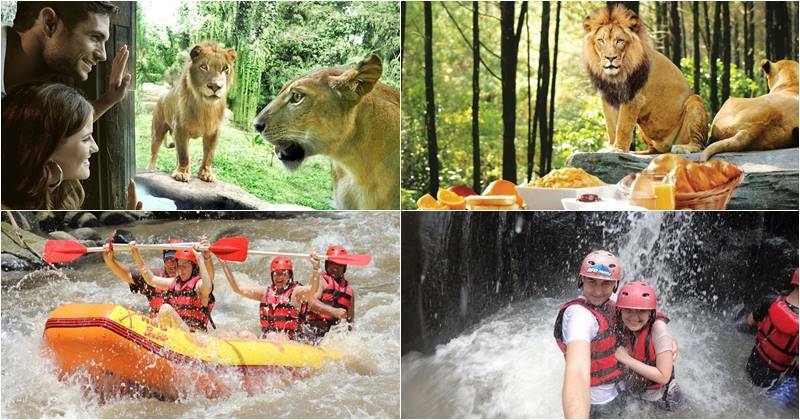 The program will a great combination of Breakfast with Lion at Bali Safari Marine Park then enjoy the fund adventure white water rafting at Ayung river with 2-3 class which is safe for child from 7 years old and also safe for beginner and non swimmer. Many visitors want to combine breakfast with lion and tours in Bali. Here we share each other and you can decide which you like to do. The Bali Safari Marine Park Breakfast with the Lions Bali is a new Bali Marine Park program, an exciting breakfast experience you will never find elsewhere in Bali where you can dine while watching spectacular natural wildlife like lions. Bali marine park breakfast with Lions is the first African restaurant in Asia which allows you to have a magnificent pride lion at our Tsavo Lion Restaurant. Your breakfast at Tsavo Lion’s restaurant, which is safe separated by full sized glass panes, will be accompanied with a lion of our pride. Then tour continue to join on afternoon white Water Rafting Ayung River with 11 Km long journey for about 1,5-2 hours trip along the beautiful river. After shower and changes, lunch will served and the end of your day before transferred back to your hotel. Ayung River Bali is considered the best whitewater rafting site of the city of Bali for the Ubud rafting tour. Because of the white water in Ubud it is very suitable for start – ups and for families. The Ubud River is the longest river on Bali Island. The river Ayung whitewater is about 68.5 km long. Go to Bangli regency, Gianyare Regency, Badung Regency and finish on Sanur beach Strait Bali from northern mountain. Ubud River rafting is the first whitewater rafting trip in Bali. As one of Bali’s longest river, the Ubud white water rafting adventure offers an exciting and central Bali nature tour. You’ll enjoy the Bali rainforest and maintain a very well-kept rice field if you do Ayung rafting Bali. You can also see wildlife like the beautiful Blue Javan Kingfisher in the Bali rainforest. You can find this by taking water rafting from Ubud if you wish to discover a hidden waterfall. Scenery and wildlife, including rice fields, jungles and waterfalls, are available here. You must go to the village Ubud in Gianyar if you’ve visited Bali and had enough sunbathing for several days and enough beach. Also, the Ayung whitewater stream, one of the most famous rafting in Bali, can be easily reached from the village of Ubodi. Not only can you get to Ubud easily, but also from Sanur, Nusa Dua, Jambaran, and Kuta, whereas Kuta beach Bali is 35 km away from Ubud village. Nearly 1 hour and 15 minutes driving time. It is also located about 5 kilometers away from the village of Ubud. The village of Ubud is also the center for Balinese art while the village of Ubud contains a lot of leading Balinese dancers, painters, carvers and artists. Class II – III / Beginner: Ayung Rafting Difficulty levels. Ubud River’s quick class is perfect for beginners or beginners. Also easy to reach and perfect for those who never try rafting. It was therefore regarded as a familiar whitewater rafting river in Bali. You don’t have to wait for a good season for those who want to do Bali rafting in Ubud. It is perfect for rafting all year round because of the Ubud River. Ayung Rafting Bali also offers half day rafting and is offered throughout the year. We walk down and down pass 300 steps to reach the starting point and finishing point. If you interesting doing on the other river on other single day, we also offers one day Telaga Waja River, READ MORE……. 12.00 – Witness Elephant show. 14.00 – Arrive at Atv location / Registration then go to rafting start point. 14.30 – Start the Rafting after safety brief from our guide. 16.30 – Arrive at finish point then walk up for shower / changes and having Lunch. 17.30 – Transferred back to your hotel. Private tour with fully air conditioned car. Breakfast with Lion at Tsavo restaurant. Extra dry cloths, short or swim wear, Sun lotion, insect repellent, socks if any, camera and extra cash for extra drinks or souvenir. Payment by online Visa/Master Card with 3% extra charge. Cancellation on Departure will be 100% charged. For Group booking, get special deals.